In the Book of the Amdouat Re in its journey had to unite with Osiris in the depths of the night and receive the power to be reborn in the morning. This idea written in hieroglyphs needed its iconographic reflection. Here ancient Egyptian artists from XVIII Dynasty started their brainstorming. One of the first ancient Egyptian icons depicting the union of the sun god and Osiris is an image belonging to first hour of the Amdouat. The god Khepri (the morning sun) raises in his day bark. 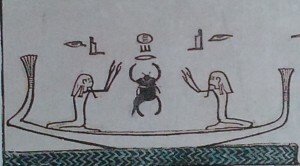 He is flanked by two figures with raised arms, who the hieroglyphs identify as Osiris. There is no trace of Isis and Nephthys in this scene. The two goddesses-mourners were depicted in the eleventh hour as cobras with the crowns of Upper and Lower Egypt. Not for nothing the eleventh hour prepares the rising of the sun, so his rebirth. In the ancient Egyptian funerals the two professional mourners carried out a mourning ritual for granting the dead’s resurrection, so it makes sense the presence of Isis and Nephthys in this hour of the journey of the sun god to his new life. However, in some moment of the ancient Egyptian history artists and priests considered that Isis and Nephthys were necessary in the rebirth context and had to be a part of the iconography of this union and resurrection of Re and Osiris.